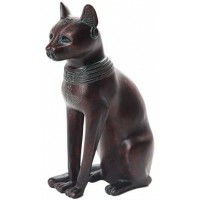 With the head of a cat, Bastet is one of the most popular Egyptian Goddesses. 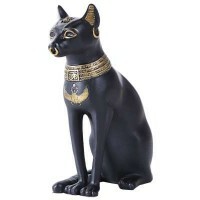 Finely detailed cold cast resin statue is just under 12 inches tall with hand painted gold detail. She holds an Egyptian staff in one hand and an Ankh - the symbol of eternal life - in the other. 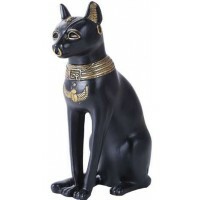 Choose this gorgeous statue in black resin with gold detail, or bronze infused resin with gold and color detail. Item Number: PT-10830 | Approximate Size (Inches): 5.10 wide x 3.75 deep x 11.45 high | Approximate Shipping Weight: 2.00 lbs.